Foundation piles are needed when soil and ground conditions are not suitable to support the structure to be built upon. Pipe piles are normally used in deep foundations to transfer the structure load to rock formations or to stronger soil conditions deep beneath the ground. Southland Pipe & Supply has the ability to cut and splice various diameters and wall thicknesses of carbon steel pipe piles to accommodate the specific load requirements of these structures. We also have the ability to fabricate piling lengths up to + or - 93 feet and to attach plates, shoes or conical points as required. We offer mechanical & torch cut ends as "Bevel x Square" or "Bevel x Bevel". Our welders are AWS D1.1 certified to accommodate most marine piling, bridge piling or building pile requirements. 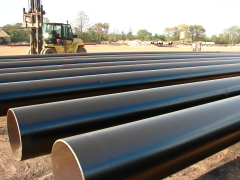 Southland Pipe offers a full range of ERW Steel Pipe, 8 5/8", 10 ¾", 12 ¾", 14", 16", 18", 20", 22", 24" and larger to 48", in various wall thicknesses from 3/16" - ¾". Pile beveling standards include "cut to 30º beveled angles" and weld filled. ERW ASTM A252 piling is available in Grade 2 and Grade 3, as "bare pipe" or optionally coated direct from our plant. If you work within building construction, offshore / marine construction or bridge construction alongside contractors performing pile driving, please count on us for your pile supply. Our company fabricates and delivers "cut to length" pilings. 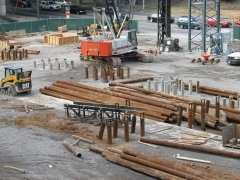 Single random lengths, double random lengths, and uniform length pilings. Since 1992, our team has acquired a vast amount of experience quoting, producing, and delivering orders for steel products, such as bore casings and foundation pilings. You can feel confident knowing that the construction piling supply you receive from us has highly experienced craftsmen fabricating and processing pipe and piling for your installation requirements. Our supply is "new and unused" direct from the mills. Due to our experience, our central location in the Southeast and our purchasing power, our prices are very competitive. Not only do we supply companies in the Southeast and nationwide, we ship internationally, and in most cases we deliver direct to the job site. Southland Pipe & Supply Company is located in Bessemer, Alabama just off I-459 southwest of Birmingham, AL. Please, call us at (800) 886-9764 or Email us at sales@southlandpipe.net. 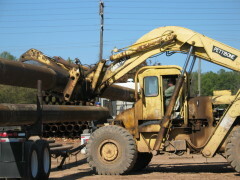 We look forward to the opportunity to serve your pipe and piling sales & supply requirements.